The timing couldn’t have been more perfect. 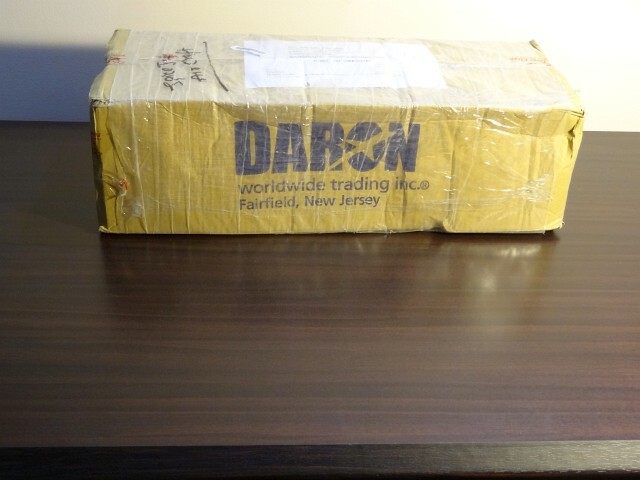 It’s the day of hearts, and the evening prior, FirstFlight delivered am almost 2 foot long box that had a photo of a SpiceJet aircraft on the side. The wait was over – VT-SZK ‘With all our heart’ was finally home, from SpiceShop, manufactured by Skymarks to a 1:100 scale. 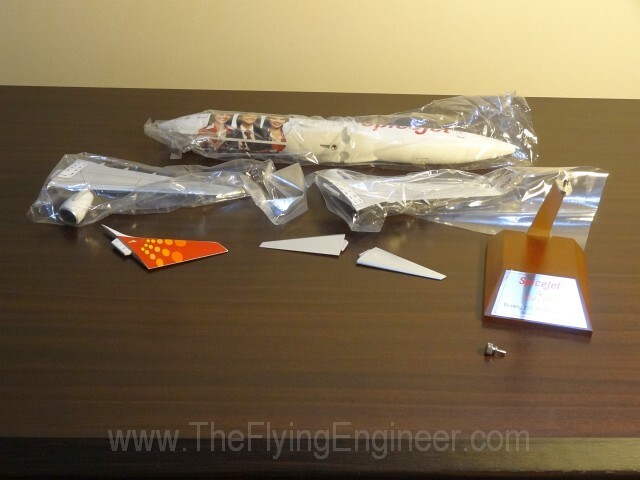 Inside the box were layers of black foam that carefully housed in all eight parts – The 15 inch long fuselage with the nose gear pre-fitted, both wings with the engines and min gears pre-fitted, the two horizontal stabilizer pieces, the vertical tail, a wooden base stand, and a securing screw. It couldn’t get simpler. All pieces were were packed in plastic save the rudder and the horizontal stabs, which had made their way to the bottom of the box, where it may be prone to damage. Assembly took just a minute, as all parts are snap fit and firmly stay in place. 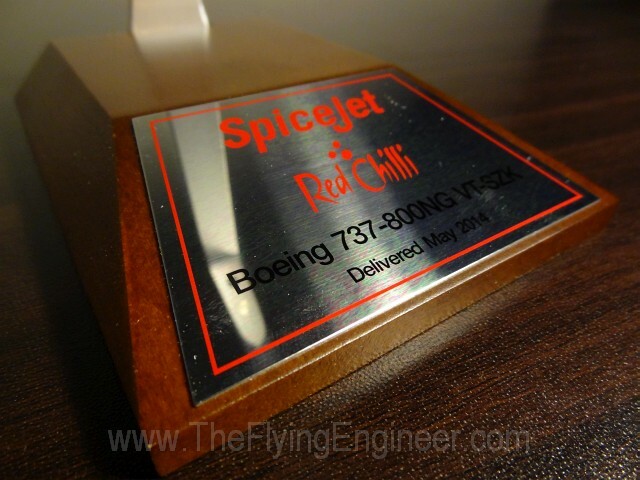 The stand for the model is made of two parts – a wooden base with a polished metallic plaque bearing the SpiceJet logo, the aircraft name ‘Red Chilli’, the aircraft model, registration, and the month and year it was delivered to SpiceJet. A matt finished aluminum support is secured to the wooden base via to screws, which were loose. You’d need a star (‘+’) screwdriver to tighten the screws, to prevent your model from wobbling with fake turbulence on the table. 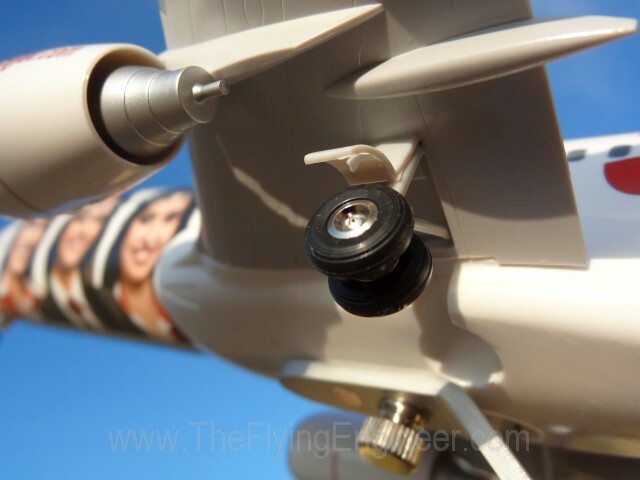 The support is keyed to align the hole on the support with the threaded hole at the bottom of the model’s fuselage. Slight alignment is necessary before the securing screw can be inserted. VT-SZK was delivered to SpiceJet in May 2014, is leased from BOC Aviation, and is the airline’s prized airplane for many reasons. 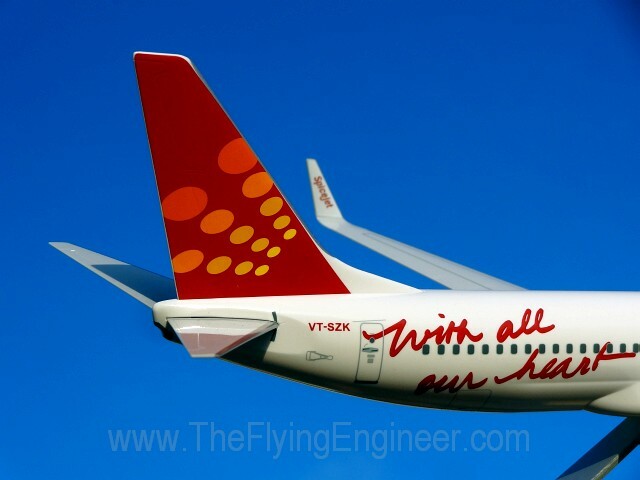 It finds a special place in the heart of perhaps all its employees for the singluar reason that it is the only airplane in the fleet to have an off-beat livery. The forward fuselage features three crew on either side. On the left is a lady captain flanked by two lady cabin crew, and on the right is a male captain flanked by two other lady cabin crew. The featured crew are: Capt. K. Rangarajan, Captain and Examiner, Boeing 737. Capt. Anushree Varma, Captain, Boeing 737, CCIC Roshika Chettri, CCIC Rashmani Singh, CCIC Prexa Kaushik, CC Lavi Choudhary. The aft fuselage of the real aircraft is stickered ‘SpiceJet’ on the left, and ‘With All Our Heart’ on the right. Perfect for valentine’s? 1:100 – How scale is the model? 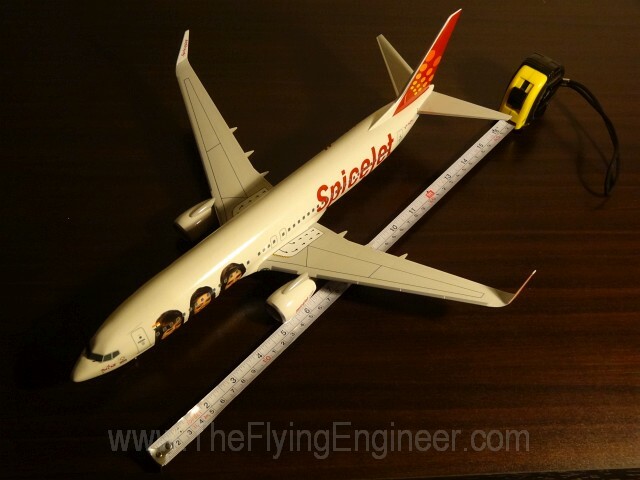 The measuring tape determined the length of the fuselage to be approximately 15 inches. We say approximately because a collector would never get a hard surface to contact the fuselage, for fear fo damage to the decals. The real 737-800 has an overall length (nose to the trailing tip of the horizontal stabilizers) of 1,554 inches. 1,544 / 100 (scale) = 15.44 inches. Yup, the model passes the scale test. Since the wings, engines, and tails appeared proportional, we took the scale on all axes for granted. 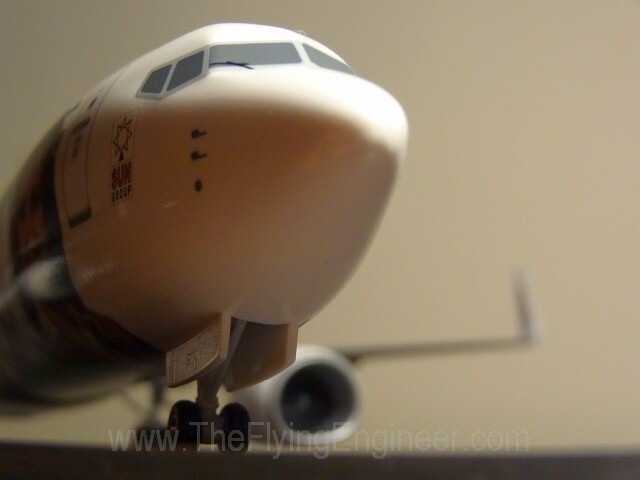 The most important aspect of any model airplane is the nose. 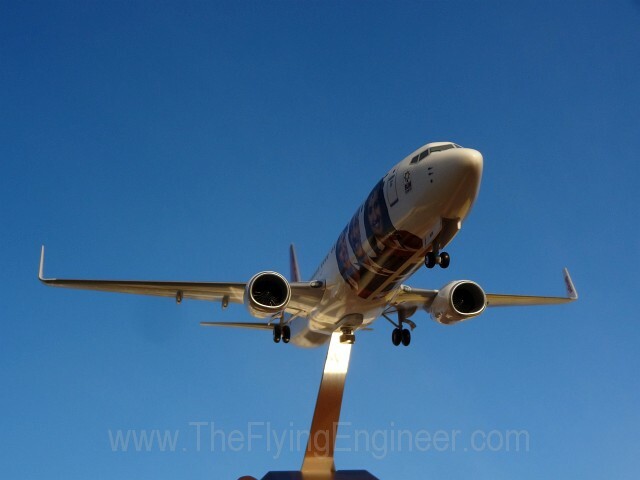 Just as a human is identified by the face, and not the body, an airplane is only a scale model is its nose appears exactly like the real aircraft. Skymarks has got it right here. The model passes the major tests. We shall progress from the nose to the tail, and examine every aspect. The nose is simply great – it couldn’t have been more ‘737’ like. The nose bay doors’ lower edge are curved, which is unlike the real aircraft (straight). The wheels are proportional, but do not move easily. 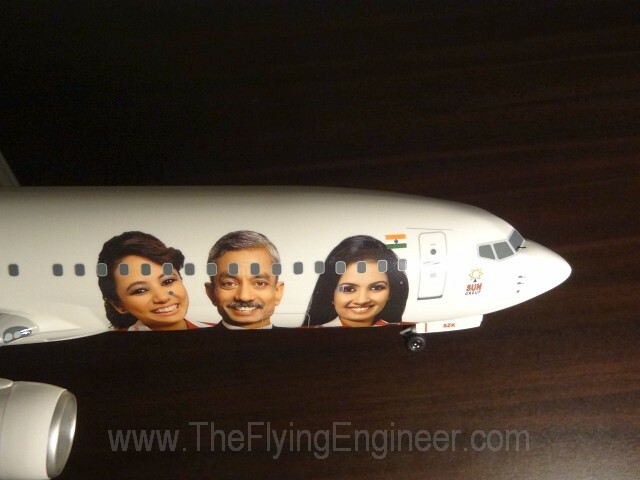 The faces on the fuselage are a little bigger than what they should have been. This can be identified by the location of the face of the first cabin crew relative to the static port (the oval under the third passenger window). The ‘missing windows’ on the 737-8000 are reproduced here – two missing on the left, one on the right (to accommodate air conditioning ducts). 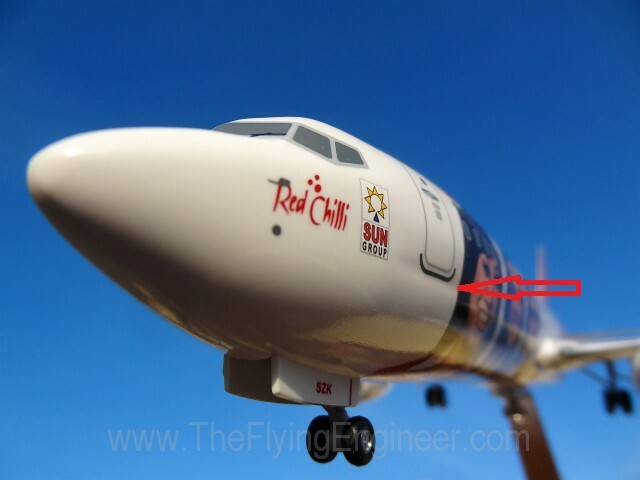 The fuselage very clearly shows the line where the ‘double bubbles’ meet (the 737’s fuselage cross section is comprised of two intersecting circles)- see the image on the left with the red arrow, pointing to a visible dent line. Although nowhere this pronounced on the real 737, it allows one to appreciate the 737’s fuselage design. As we progress to the engines, we hit a pocket of disappointment. 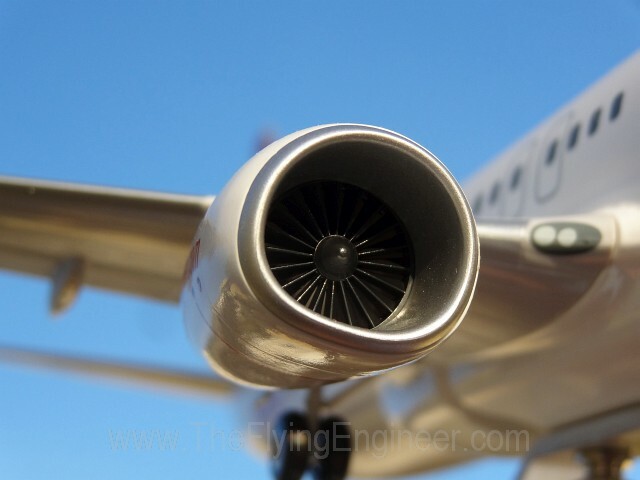 The engines that Skymarks has used are the Boeing 737- classic (300/400/500) engines, which have the ‘hamster pouch’ look – flattened bottom with a non-circular nacelle. The Boeing 737NGs have an almost circular nacelle. The engine fails the scale test big time. Further, the exhaust nozzle is also long. VT-SZK uses CFM 56-7BE engines, which have a shorter nozzle. The detailing on the wing is good, complete with the walk zones, flap track fairings, and emergency exit markings. The double slotted flaps, spoilers, and ailerons with aileron tabs are marked on the upper surface. The fuel tank access panels are also marked on the lower surface. The red ‘paint’ on the outer portion of the winglet should have run further under the surface of the winglet. The main landing gears are simple, but the tyres are good. The model would have been more of a scale had they the white wheel caps as found on SZK. The wheel wells could have been painted black for higher level of detailing. The stabilizer and the vertical tail plane are both well detailed, complete with the trim markings (trim markings are not symmetric and so it should have been on the model). The APU inlet door, and APU exhaust are marked. 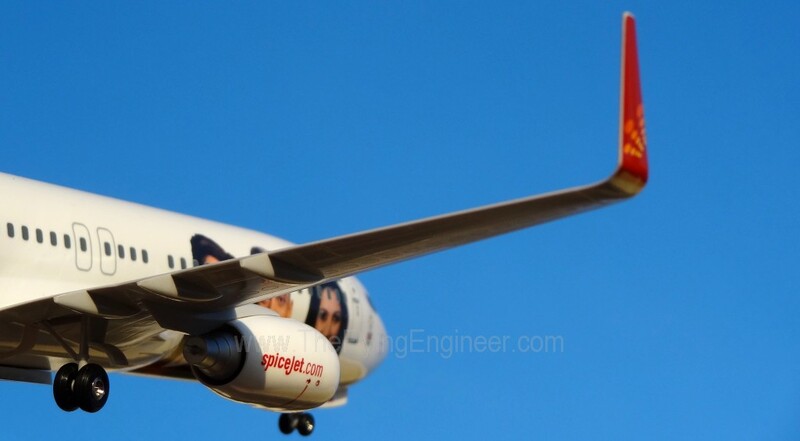 SpiceJet is the only airline in India to sell 1:100 models of its aircraft (though not on board their flights, but through their website), which is a big plus. The finish of the Skymarks 737-800 is overall good, but could be better with more detailing, such as fine print text near the statics. It is definitely a model for the collector, but does disappoint a bit when it comes to certain details. Hogan’s eye for detail is much better (Example: IndiGo’s A320 ‘Premium model’ sold on board), but then, they do not offer this large a scale. On the pricing front, the Boeing 737 1:100 is available for INR 9,499 + 13.125% tax + INR 500 shipping = INR 11,246. On airlinemuseum, Skymarks 737-800s are available or US$95, which translates to INR 5,900. Add customs and freight, and the model’s price comes close to SpiceJet’s price, perhaps cheaper by a thousand or two (or three?). 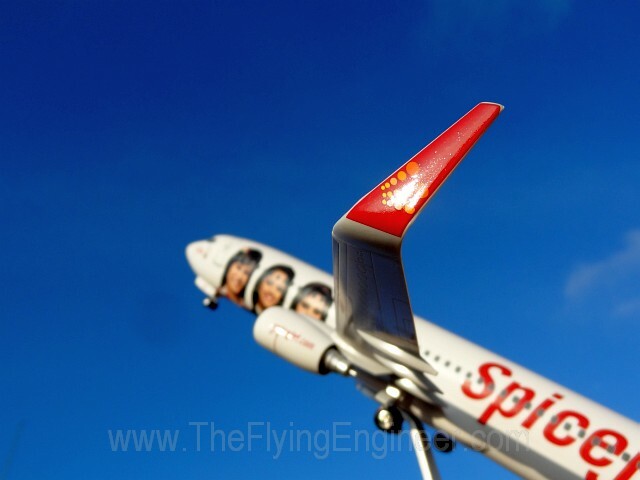 But SpiceJet’s price is justified by the limited edition of its infamous aircraft. In short – a lovely airplane model, largely faithful to the 1:100 scale, and with a finish and color accuracy that is bound to catch eyes and make you stare speechlessly – with all (y)our heart! Must have for a serious model collector.